This comprehensive data mining textbook explores the different aspects of data mining, from basics to advanced, and their applications, and may be used for both introductory and advanced data mining courses. 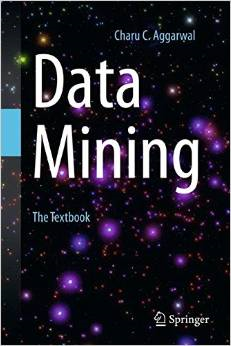 Comprehensive textbook on data mining, 734 pages. The table of contents (PDF). The emergence of data science as a discipline requires the development of a book that goes beyond the traditional focus of books on fundamental data mining problems. More emphasis needs to be placed on the advanced data types such as text, time series, discrete sequences, spatial data, graph data, and social networks. The fundamental chapters: Data mining has four main problems, which correspond to clustering, classification, association pattern mining, and outlier analysis. These chapters comprehensively discuss a wide variety of methods for these problems. Domain chapters: These chapters discuss the specific methods used for different domains of data such as text data, time-series data, sequence data, graph data, and spatial data. Application chapters: These chapters study important applications such as stream mining, Web mining, ranking, recommendations, social networks, and privacy preservation. The domain chapters also have an applied flavor. The book carefully balances mathematical details and intuition. It contains the necessary mathematical details for professors and researchers, but it is presented in a simple and intuitive style to improve accessibility for students and industrial practitioners. Numerous illustrations, examples, and exercises are included with an emphasis on semantically interpretable examples. The book is available in both hard-copy and in electronic form. The hard-copy is available from the usual channels such as Amazon, Barnes and Noble, or Springer shop. This link might allow you to to download the book for free, depending on your institution's subscriptions. To attempt a free download, click from a computer directly connected to your institution network. To be eligible, your institution must subscribe to "e-book package english Computer Science" or "e-book package english (full collection)". If your institution is eligible, you will see a (free) `Download Book' button. Otherwise, you will see a (paid) `Get Access' button.